You’ve come here for a reason. The Union Aerospace Corporation’s massive research facility on Mars is overwhelmed by fierce and powerful demons, and only one person stands between their world and ours. As the lone Doom Marine, you’ve been activated to do one thing -- kill them all. I honestly think we're looking at a spring blockbuster and a truly worthy reboot of a timeless classic. DOOM isn't for everyone. The blinding speed of play, demonic symbolism, demanding controls, and hyper-violence may discourage some from jumping in. If you can handle it, though, it really is a thrill ride. It's a brass-knuckle punch in the mouth. It's a 2-ounce shot of hard scotch from a skull chalice. It's a shot of adrenaline straight into your eyeball. It's DOOM. The balance between action and exploration was handled with the required finesse, and I know that I will be spending many more hours with the game, even though I completed its campaign long ago. A mediocre multiplayer is the only thing holding this game back from being everything young me could have dreamt of. DOOM is 2/3 really good and 1/3 really mediocre. The single player campaign is an absolute blast and if you like the shooting action from that you can get all you can eat via Snap Map. 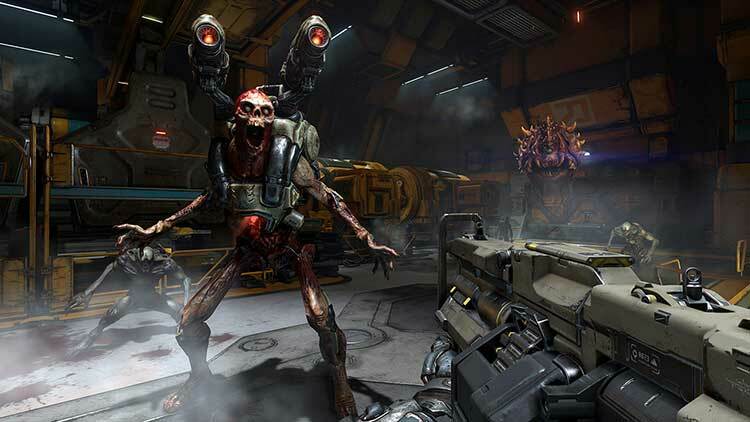 DOOM competitive multiplayer is really unfortunate, however. If it could’ve captured even some of the magic from the campaign it might be tolerable, but as it stands, it feels like it should’ve been aborted and nobody would likely have missed it. 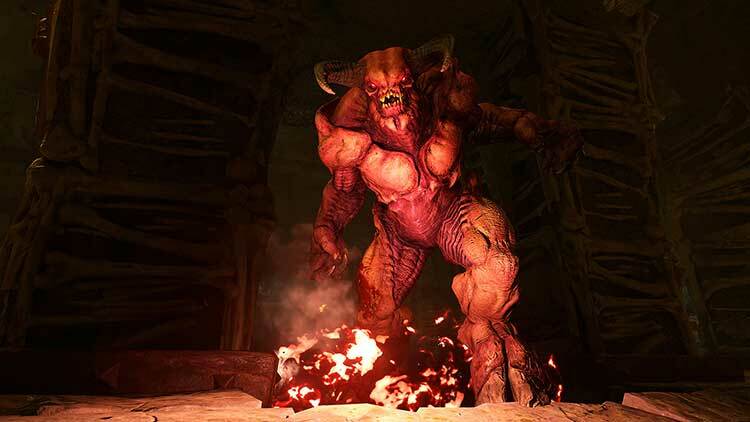 Doom is exactly what I wanted from a modern take on one of my favorite franchises. There is more than enough meat here to satisfy even the most jaded player. Add that to the fact that the combat is simply sublime, while also being a blast, and we have a package that brought a smile to my face the entire time I was playing it. 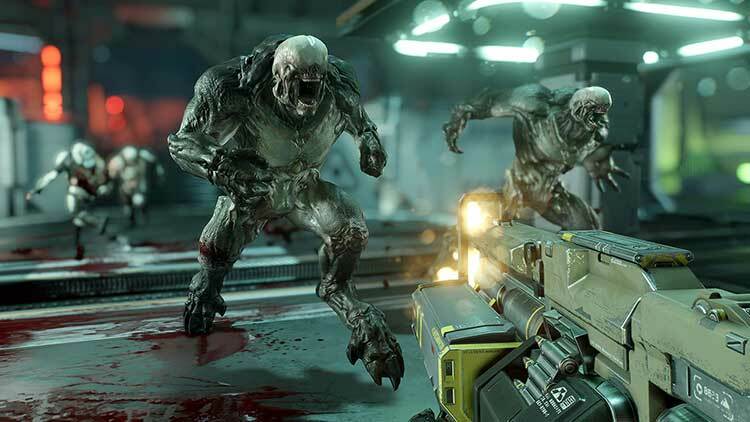 Doom struggles somewhat to finish what it starts, and for a franchise that practically created what we understand as shooter multiplayer 22 years ago, its largely flavorless multiplayer is surprising. But on the whole, as a new interpretation of one of gaming's most formative, difficult to pin down cyphers, id has done a pretty great job in making something that feels familiar and fresh, and, most importantly, pretty damned fun. 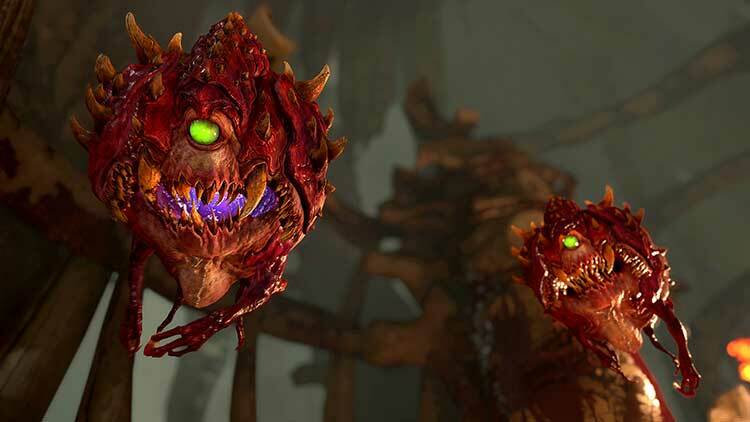 This new Doom is what I’ve been waiting for, a perfect mixture of old concepts and new technology brought together for the current generation. The fast-paced action of yesteryear is coupled with giant stages, customizable and shareable maps, and a robust if slightly generic multiplayer offering, the final result being a super fun way to blast through a few hours. There’s no Doom and gloom here; this new game is a hell of a good time. While we wouldn’t go anywhere near as far as to say that this online facing side of the game is an afterthought, it doesn’t carry with it the same sense of intense playtesting and meticulous detail as the solo campaign. One feels honed by years of trial and error. The other feels like it was built with confidence, but not necessarily the same passion. Doom is a truly spectacular bit of ultraviolence, but it’s deceptively smart in how it goes about it. It knows that all you want to do is blow stuff up in increasingly more brutal ways, leading to a single player that is probably the best FPS campaign since Wolfenstein: The New Order. While multiplayer is almost a damp squib, Snapmap allows for those with creative minds to unleash their creativity with an easy-to-learn map editor. DOOM es diversión rápida, directa, frenética. Hacía tiempo que no nos enfrentábamos a una campaña de un shooter tan veloz y lleno de ritmo. Es su parte principal y es la más lograda. El multjugador es poco inspirado, al intentar una mezcolanza de lo nuevo y lo viejo, mientras que el Snapmap es un editor lleno de posibilidades aún por explotar. Die Geschichte mag mal wieder überflüssig sein, aber das Level-Design, die flotten Kämpfe und die motivierenden Extras halten die gesamte Spielzeit bei der Stange. Doom macht Spaß und schafft es tatsächlich, das alte Spielgefühl in die Moderne zu transportieren. Revolutioniert das neue Doom wieder ein ganzes Genre? Nein. Aber es macht verdammt viel Spaß. 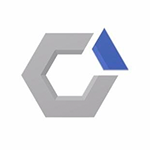 L'absence de power moves et, plus globalement, le plateau précoce de la courbe de progression laisseront peut-être le joueur sur sa faim et empêcheront le titre d'entrer au panthéon des FPS. Son mode multijoueur, qui sans être un ratage complet est aussi générique que soporifique, ne plaidera pas en sa faveur. Derrière ce nom se cache en réalité un éditeur de niveaux relativement complet et facile d'accès, grâce auquel on peut créer de multiples cartes. Naturellement on peut également se contenter de celles créées par la communauté. 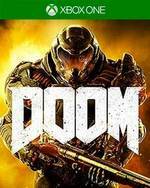 Au final, si Doom ne sera peut-être pas le jeu de l'année 2016, mais il s'agit en tout cas d'un très bon reboot, qui renoue avec ses racines et offre régulièrement des sensations fortes. On n'en demandait pas plus ! 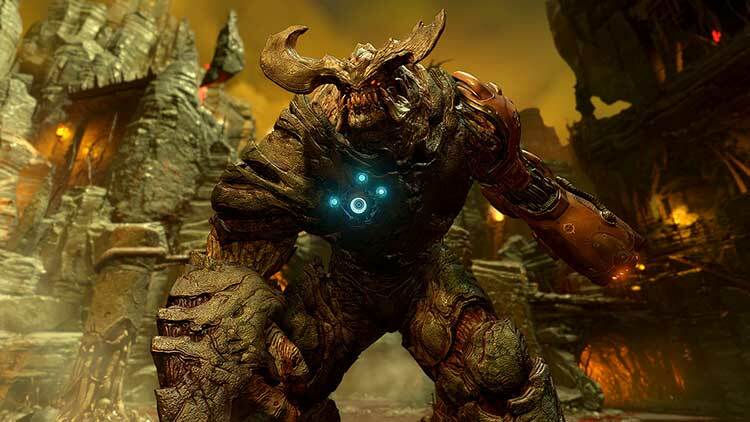 Excluding some defect earlier indicated, including a level not always intuitive design, the upgrades and power ups that are never to be actually essential or necessary, DOOM appears to be a product of very large bill, able to keep you busy for more than ten hours with his campaign and several days of play in multiplayer, which is also not perfect and not without flaws, but still managed to secure a wild and varied entertainment. Doom känns som Doom. Hade någon frågat hur det första Doom hade sett ut idag så är det här förmodligen det korrekta svaret. Det är snabbt, intensivt, snyggt och blodigt. Det känns gammalt utan att kännas förlegat och tempot i striderna gör det lätt att bara fortsätta lite till, hela tiden.